It is an ePayment Processing platform developed by Asseco SEE. NestPay® meets the needs of financial institutions particularly banks that propose to offer collection solution to their customers in the online payments market substantially. 3D Pay Hosting model is the basic internet integration model with payment page hosting, supporting 3D transactions. Payment is done automatically by Nestpay. This Magento extension offers an online payment solution for webshops and websites of all sizes. It is based payment gateway provider which enables you to accept Credit Card, Net Banking, Credit Card payment on your online store with the simplest and fastest integration. Higher Conversions - Benefit from our smart transaction routing and intuitive payment experience, that drives higher success rates and lower cart abandonments for your online store. User Experience Redefined - Let your customers enter their card details without leaving your website. Offer the fastest checkout experience by enabling your customers to use their cards. Great Merchant Support - We bring NestPay's customer obsessed service and learnings from solving payment issues. NestPay / Asseco technical support is available 9 AM to 9 PM, all days of the week. 100% Secure - NestPay has undergone stringent security audits (including PCI DSS) by industry experts. NestPay's real time risk engine analyses every transaction across 50+ risk parameters and notifies you about suspected fraudulent transactions by email/sms. Simple Transparent Pricing - No setup fee, no annual maintenance fee, no hidden charges. Pay less as you grow. We have created a short video to dimostrate how the extension works. Open this video in fullscreen mode to read and see all the features. Copy the content of the zip file received by email in to the root of your Magento 1.9.x store. Log into your backend administration area. Under tab "SALES > PAYMENT MODULE" navigate to "NestPay3d"
Set "Nestpay enabled" as "Yes"
It is strongly recommended, that you are using the debug method during your extension tests. 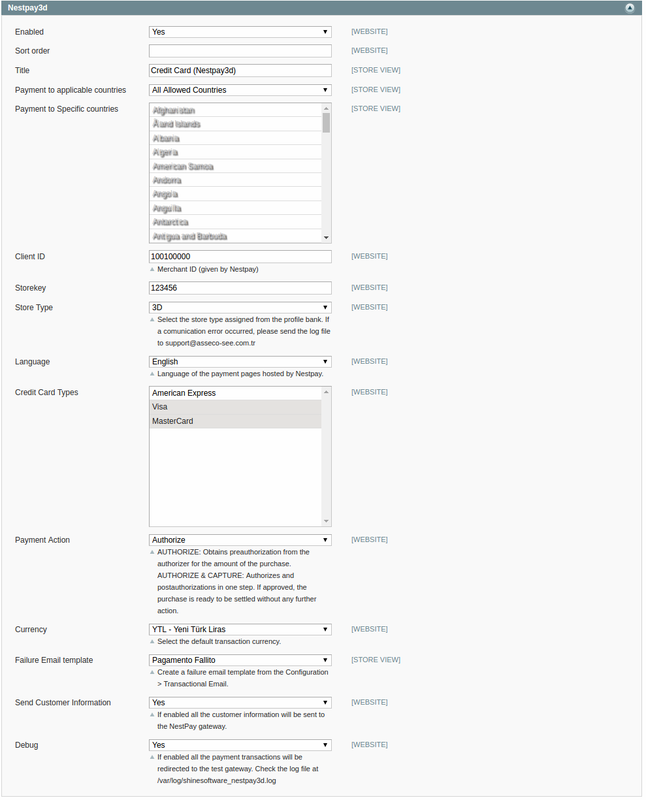 Set the "Default Language" of the bank payment page. Set the "Payment failure template". This feature helps the customer to understand why the payment transaction fails by an email message that Magento sends to their mailbox. You have to create your failure template on Magento using the System > Transactional Email section. Then you have to set your Failure Template message in this extension configuration. Set the "Send Customer Information". If enabled the bank receive all the Customer's information. Add one of your product in your store cart and go to the checkout. Use these credit cards to test the payment transaction. Submit the order and wait the redirection to the 3D secure system site. Use the 3D Secure Password written below to confirm the payment transaction. 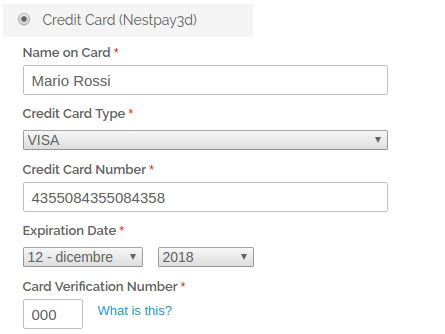 The frontend page of the NestPay 3D extension is a simple web form where the customers have to fill with the credit card information. We strongly suggest to use a SSL Certificate to protect your website according the PCI DSS request of the most payment gateway system. In order to solve any Magento extension problem issue, we invite you to activate your Magento System Log and open on Ticket System at http://shinesoftware.com/login and attach the log file (zip the file before uploading it). The NestPay extension includes a log system to check all the communication between your Magento store and the NestPay service. Go to /var/log/shinesoftware_nestpay3d.log to read all the requests and responses from both directions. If you need assistence you can dron an email to the support@asseco-see.com.tr attaching the log file and the error description. The NestPay extension has been translated into Italian and English, soon it will be translated into Turkish language too.